Many of Vetruvian’s staples come at low rarities: First Wish is a free card in any minion-based list, the golem package provides great tempo in the early game, and Sandswirl Reader and Blood of Air are among the game’s best single-target removal. This deck looks to leverage these tools in the most cost-efficient way, quickly assembling a threatening board and then pushing damage through with your removal options to close out the game. 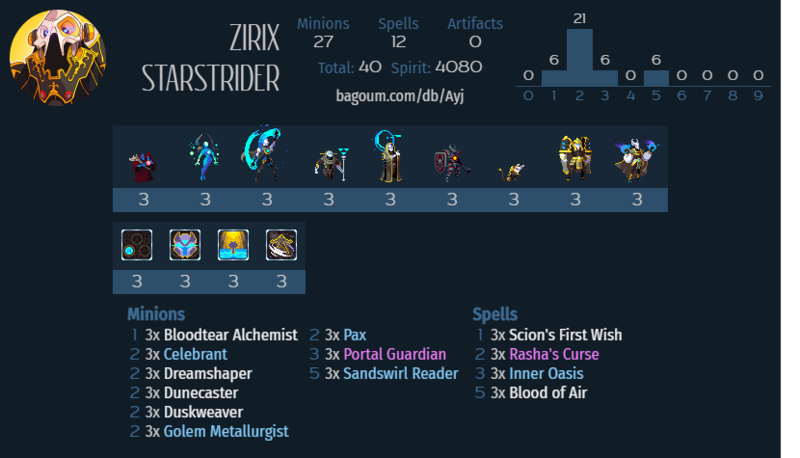 While 4k spirit is on the high end for budget, the deck is complete as presented and doesn’t require upgrading to be played competitively at the highest level. Metallurgist and Celebrant are mana-efficient bodies with good stats. In particular, they are our only 2 drops with more than 2 base toughness, and hence not as reliant on buffs to stay alive. However, the real reason we’re playing them is to support Dreamshaper, which is even better here than it usually is. Not only does it keep the cards flowing, but our swarm synergies mean that we can actually use the 2/2 body for more than just a speed bump. Pax is a great amount of stats over multiple bodies for a minimal investment, and is no longer punished by Thunderhorn so frequently (although watch our for those Ox decks). Since all of the Scion’s Wishes are relevant in this deck, Duskweaver draws an actually good card when it dies and not just replace fodder. Both of these are straightforward to play: drop them as early as possible and get your value. Dunecaster is a little trickier: while it’s fine as just a good amount of stats for 2 mana, and better when you can squeeze extra value out of it by using it on a Wind Dervish, sometimes it’s best to hold it as out-of-hand burst to finish the game. Bloodtear is a body and a ping for just one mana, which is always useful. Sandswirl Reader and Blood of Air are incredible tempo removal, taking care of opposing threats while allowing your army to keep pushing damage. It’s generally better to play Sandswirl before BOA if you have the choice, since the value generated by the 3/3 body and the Exhuming Sand tile is more relevant earlier while the rush damage is more immediately impactful late. 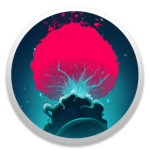 Scion’s First Wish is as cheap as possible, gives you something to do with any excess mana, provides stats that immediately affect the board, and doesn’t cost a card – there’s a reason it’s in practically every Vetruvian list. Inner Oasis makes your board much more resilient and critically, allows your random dorks to get in multiple hits on the enemy general without dying. It serves as a bridge between your early game swarm and late game damage push. These get their own section due to their importance, both serving critical roles in the deck. However, they also account for over half of the spirit cost of the deck, so I’ve included some more budget-friendly substitutions. Portal Guardian is among the best 3-drops in the game after it got buffed, and is your opening play with the highest upside. Its large toughness and swiftly growing power make it hard to deal with and dominant in the early game. While you don’t want give the enemy free hits on this while it has low power, you also don’t want to be too conservative with how you position it, since your opponent will be able to remove it eventually. If you can get in one solid hit with it and force them to spend resources, it will have done its job well. Potential substitutions: Blaze Hound, Fireblaze Obelysk , or Bloodbound Mentor. Your main source of game-ending burst. While not that much damage on its own, the Wind Dervish is a cheap rush minion on which you can stack buffs, including Dunecaster or Scion’s Third Wish (from Duskweaver), to win the game after your opponent has stabilized the board. Potential substitutions: Bone Swarm, Scion’s Second Wish, or Dustdrinker.